Police have released pictures showing two of a series of letter bombs sent to UK businesses. 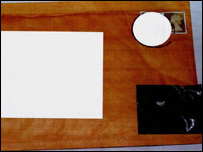 One is of a bomb which was intercepted while the other image is of a device after it had detonated. Officers are probing a total of seven mail bomb attacks on businesses since 18 January. Three took place this week. A 48-year-old man who phoned a live radio show claiming to have sent one of the bombs has been arrested and detained under the Mental Health Act. The man "confessed" to sending a bomb to accountancy firm Vantis in Berkshire after calling BBC Radio 2's The Jeremy Vine Show. He was not allowed on to the live show and the police were contacted immediately. Police are still checking for activist links to all the letters, the latest of which was sent to the DVLA in Swansea on Wednesday. Anton Setchell, the police's national co-ordinator for domestic extremism, said the investigation - codenamed Operation Hansel - was continuing at a "very fast pace" and "progressing well". He described the arrest as a "significant development". He added that the pictures of the mail bombs had been edited to hide identifying features on the packages - doing so, he said, was "essential" so as to not compromise the investigation. "The focus of my investigation remains broad," he said. "I continue to investigate leads that point towards animal rights extremism but equally I am focused in several other areas." The BBC has also learned that the name of a second animal rights activist was found on one of the bombs, delivered to LGC Forensics, in Culham, Oxfordshire, on 18 January but this failed to explode. Another device carried the name of jailed protester Barry Horne who died on hunger strike in 2001. Thames Valley Police told BBC Radio's Five Live the LGC Forensics letter included the name of a "prominent animal rights activist who is still living". Police said the name was written on the envelope and that there were strong links between the first three letter bombs received and animal rights activists. 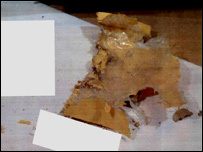 Letters were received on 18 January, by LGC Forensics and by Orchid Cellmark, in Abingdon, Oxfordshire, which injured one woman. A third letter bomb, which failed to detonate, was delivered to Forensic Science Services in Chelmsley Wood, Solihull. The Orchid Cellmark bomb contained the words "Dr Barry Horne RIP". Mr Horne, who was not a doctor, had been sentenced to 18 years for planting bombs. On Monday, a bomb sent to the London offices of Capita, responsible for the congestion charging system, causing minor injuries to a female employee. The next day a package exploded at the Berkshire offices of Vantis, an accountancy firm linked to Speed Check Services, in Camberley, Surrey, the provider of digital speed cameras to the police. On Wednesday, four workers were injured when a parcel bomb exploded at the Driver and Vehicle Licensing Authority's main centre in Swansea. Police discuss arrest of man who "confessed"